Outgoing ICMA Executive Director Bob O'Neill will throw out the first pitch at the RoughRiders game. Even if you aren't going to the UNT MPA Conference (we suggest you do), you can still network with some of the best and brightest of DFW's local government profession. 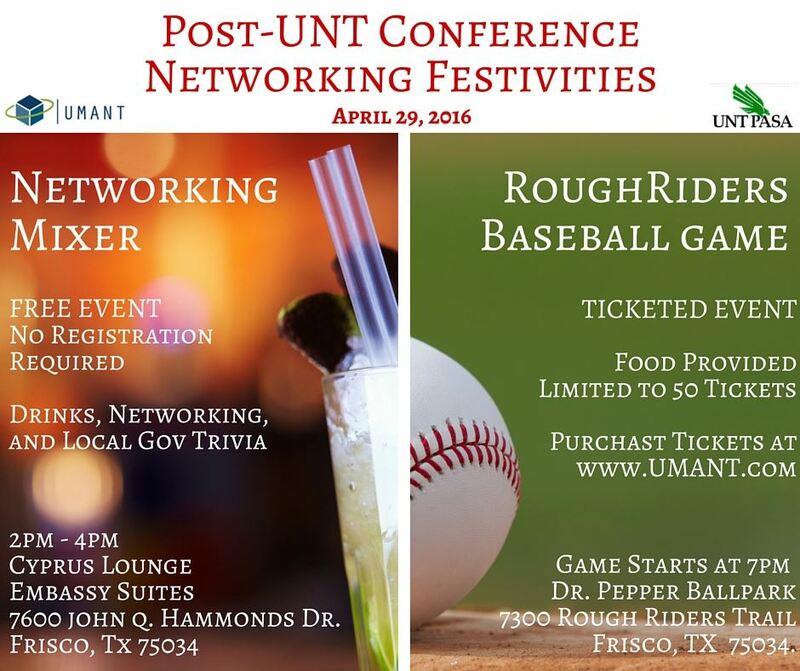 On April 29, 2016, UMANT and the UNT Public Administration Student Association are hosting TWO post-conference events! Whet your palate immediately following the Conference at this FREE EVENT (no registration needed)! Walk over to the Embassy Suites for a drink, a little local government trivia, and some local govie fellowship! Watch the RoughRiders take on the Corpus Christi Hooks in glorious fashion. We've reserved a tent just beyond Right Field and food is included in the ticket price. Limit of 50 tickets - first come first serve! Questions about the Mixer and Game? Questions about the UNT Conference?